BlackwaterBLUE from monkster.com: McEachran loan to Bolton as part of Cahill deal? McEachran loan to Bolton as part of Cahill deal? 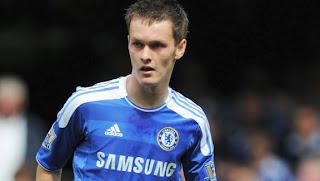 Chelsea are prepared to loan Josh McEachran to Bolton as a sweetener in an £7m deal for defender Gary Cahill. The Trotters defender is expected to be sold in January with his contract due to expire in the summer, and the Blues have jumped to the front of the queue for his signature. Andre Villas-Boas wants to pair Cahill with his England partner John Terry at the heart of the Chelsea defence and hopes McEachran will be his trump card. The 18-year-old midfielder has made just four appearances for Chelsea this season, and only one in the Premier League. But he is seen as a future England star and is expected to be loaned out in the New Year. Swansea, Nottingham Forest and Brighton have also shown interest.